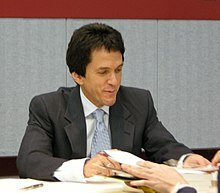 Mitchell David Albom (born May 23, 1958) is a sportswriter, novelist, newspaper columnist for the Detroit Free Press, syndicated radio host, and TV commentator. "Do the kinds of things that come from the heart. When you do, you won’t be dissatisfied, you won’t be envious, you won’t be longing for somebody else’s things. On the contrary, you’ll be overwhelmed with what comes back." "You know what that reflects? Unsatisfied lives. Unfulfilled lives. Lives that haven't found meaning. Because if you’ve find meaning in your life, you don’t want to go back. You want to go forward." "When you learn how to die, you learn how to live." "Sometimes you cannot believe what you see, you have to believe what you feel. And if you are ever going to have other people trust you, you must feel that you can trust them, too - even when you’re in the dark. Even when you’re falling." "When you're in bed, you're dead"
"Death: the only true emotion felt in an apathetic world"
"Don't hang on too long, but don't let go too soon." "Without love, we are birds with broken wings." "Is today the day? Am I ready? Am I doing all I need to do? Am I being the person I want to be?" "If the culture doesn't work, don't buy it." "If we can remember the feeling of love we once had, we can die without ever going away." "What is it about silence that makes people uneasy?" "Life has to end." Marguerite said. "Love doesn't"
"All the people you meet here have one thing to teach you." Eddie was skeptical. His fists stayed clenched. "What?" he said. "That there are no random acts. That we are all connected. That you can no more separate one life from another than you can separate a breeze from the wind." "Fairness doesn't govern life and death. If it did, no good man would ever die young." "It is because the spirit knows deep down that all lives intersect. That death doesn't just take someone, it misses someone else. And in that small distance, lives are changed." "Each affects the other and the other affects the next, and the world is full of stories, but the stories are all one." "That's what heaven is. You get to make sense of your yesterdays."